What great shakers! How fun to do the sharks in light colors. I love that you have twin cards for your kids that are not quite matchy matchy, but they coordinate! Such pretty cards..love the sparkle and colors! Awww!!! Adorable and super cute celebration cards!!! What a mermazing card!!! I enjoyed so much all your fabulous projects through this week!!! 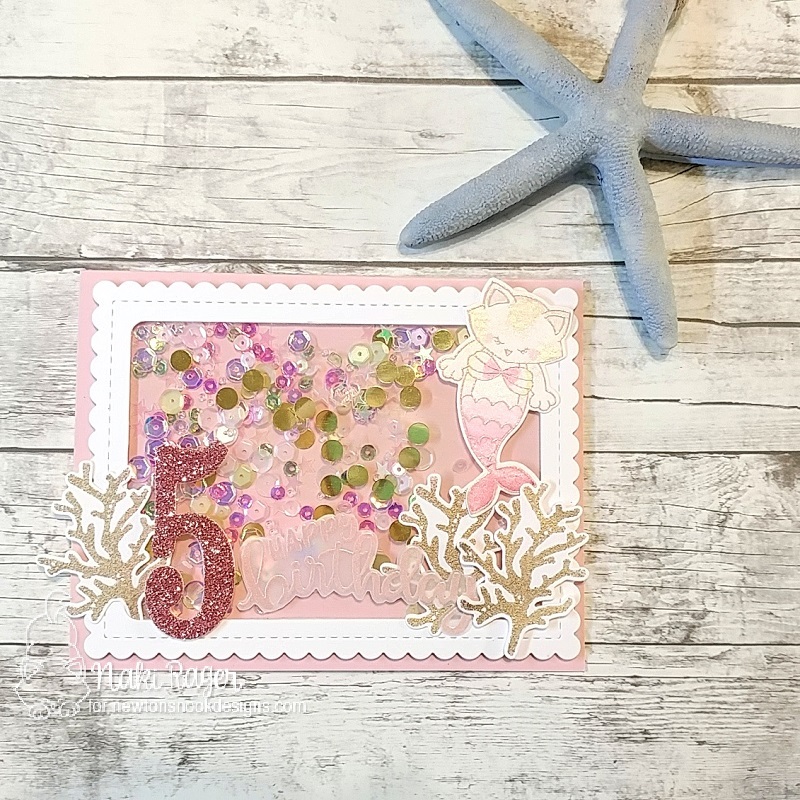 I love your cards and color choices with the pastel/watercolor look. I can always pick out your cards!. Adorable cards, love all the shiny shaker fun! So much sparkle and fun details. Lovely cards! I love your shaker cards! They are so fun :) What a perfect release for your twins' birthdays! 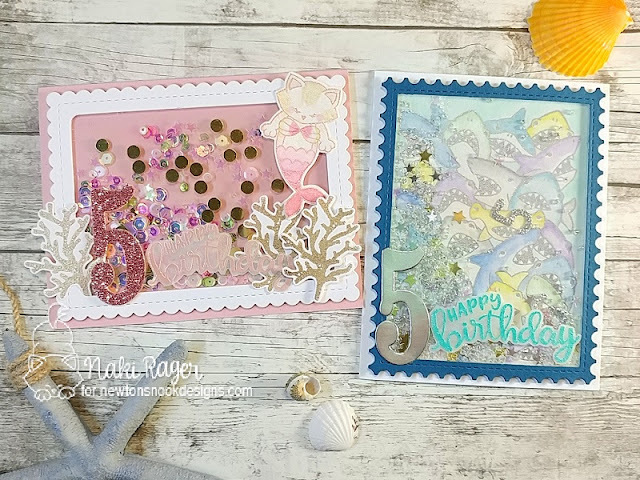 super fun and gorgeous cards! Awwwwww! These are amazing! I love that your twins are the same age as NND! You can make birthday cards for both! So fitting! I love that you used the same idea but switched up the stamps to make a shark theme and mer-cat theme! Both are just incredible! Thank you so much for helping us celebrate 5 years with our hop today! 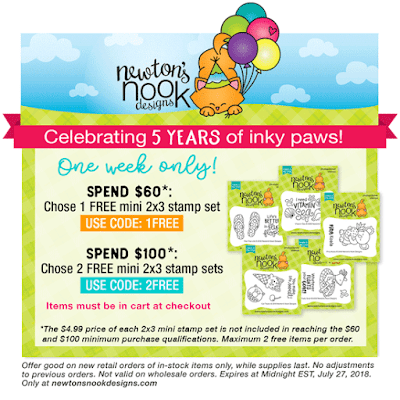 You've made great cards to celebrate the Five Years of Newton's Nook Designs!! Woohooo! 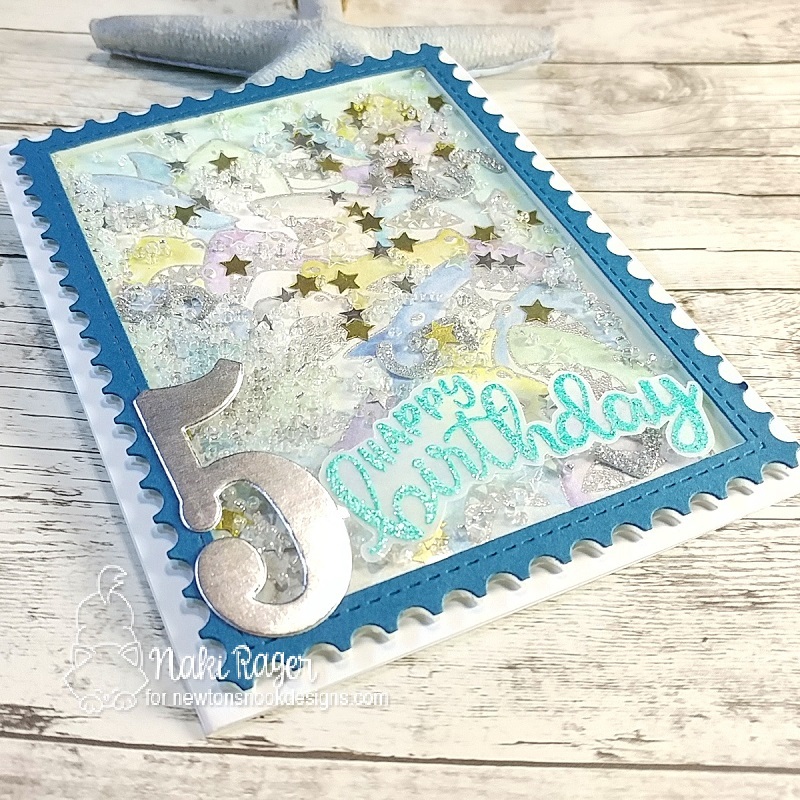 Love the Happy 5th birthday to your twins & Newtons Nook Shaker Cards! Such soft & pretty colors! Shakers are so fun and they work great with these stamps!! Beautiful cards! Such fantastic layering of elements and textures. Love the sparkle and shine. absolutely gorgeous cards! pastel sharks love them! Love your fun shaker cards! And happy upcoming birthday to the twins! They will love the cards! The colorful sharks are really cute! You had me at "shaker card" LOL. I must say I am a little kid when I see shaker cards, all the sparkle and shimmer and bits and pieces in there get me ohhhhing and ahhhhhing every time. I'm sure both of your children are going to love their cards! Gorgeous cards! Loving those sharks but also loving Newton purr-maid! The age of your twins worked out purrfectly with NN's anniversary! Congrats to the little ones and to Newton's Nook! love them. I'll bet they'll be really excited about them. are both just fabulous. Shakers are my fave type of card! Your cards are adorable ! I love shaker cards, it's always fun ! And I wish you also great fun for your shark / mermaid birthday party next month ! I love your unique take! The shaker cards are a great idea and the pastel colors are perfect! Such fun birthday cards..love how you made them into shakers. Fun and cute shaker cards for your twins. Fabulous shaker cards! Love both designs! 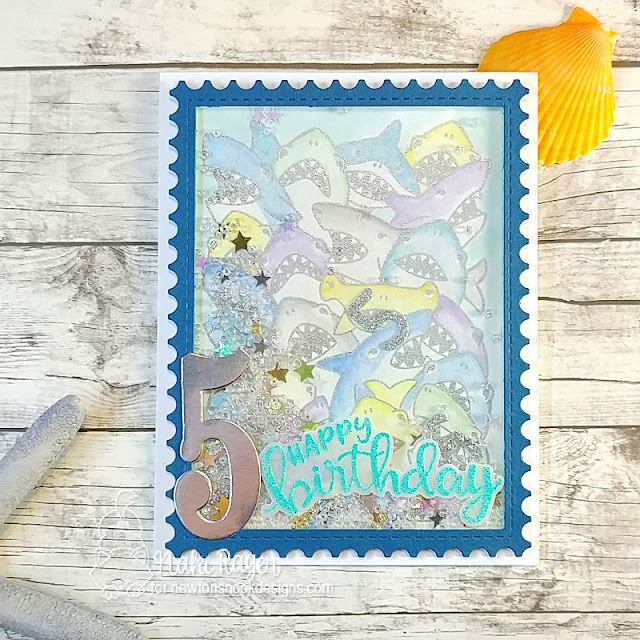 Cute birthday cards, love those sharks! Your two birthday cards are great ! And what a cool coincidence that your twins birthday fit the Newton’s Nook one !